Emily Dickinson, probably the most loved and certainly the greatest of American poets, continues to be seen as the most elusive. One reason she has become a timeless icon of mystery for many readers is that her developmental phases have not been clarified. In this exhaustively researched biography, Alfred Habegger presents the first thorough account of Dickinson’s growth–a richly contextualized story of genius in the process of formation and then in the act of overwhelming production. Building on the work of former and contemporary scholars, My Wars Are Laid Away in Books brings to light a wide range of new material from legal archives, congregational records, contemporary women's writing, and previously unpublished fragments of Dickinson’s own letters. Habegger discovers the best available answers to the pressing questions about the poet: Was she lesbian? Who was the person she evidently loved? Why did she refuse to publish and why was this refusal so integral an aspect of her work? Habegger also illuminates many of the essential connection sin Dickinson’s story: between the decay of doctrinal Protestantism and the emergence of her riddling lyric vision; between her father’s political isolation after the Whig Party’s collapse and her private poetic vocation; between her frustrated quest for human intimacy and the tuning of her uniquely seductive voice. 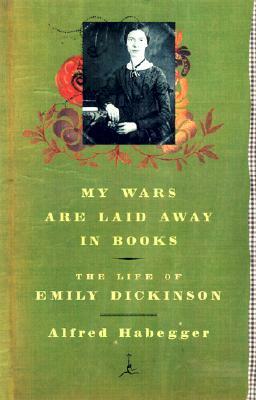 The definitive treatment of Dickinson’s life and times, and of her poetic development, My Wars Are Laid Away in Books shows how she could be both a woman of her era and a timeless creator. Although many aspects of her life and work will always elude scrutiny, her living, changing profile at least comes into focus in this meticulous and magisterial biography. Alfred Habegger, formerly a professor of English at the University of Kansas, lives with his wife, Nellie, in northeastern Oregon. His previous books include Gender, Fantasy, and Realism in American Literature an da prize-winning biography, The Father: A Life of Henry James, Sr.